HNA Group’s airline operations are central to its expansion plans as it seeks investments to reach its goal of becoming a global top 50 company by 2030. In the space of 25 years the HNA Group has evolved from a small local airline domiciled in Hainan Island in the southernmost province of the People's Republic of China to become a major force across multiple industries and a Fortune 500 global conglomerate. Today, it employs more than 113,000 staff, has assets of around $80 billion, generates revenue of over $25.6 billion and posted a profit of $206.9 million in its last fiscal year. However, this growth has been achieved in a rather covert manner and many do not realise how far the conglomerate’s tentacles spread around multiple industry sectors and encompassing core divisions in aviation, financial services, real estate, tourism, and logistics. Much of its success has been achieved by cross-industry expansion within China, but since 2008, it has increasingly looked to expand globally with its high quality service proposition in China being introduced across multiple international brands, including most recently bids for hotelier Carlson Hospitality Group and catering services company Gategroup. Wherever the business’s aviation activities and airline routes take it, other investments seem to follow across the tourism, hospitality, logistics and financial services sectors as its air connectivity become a facilitator for wider international trade. The HNA Group is certainly a growing player in the airline sector, which currently accounts for just over a third of its activities and encompasses interests in a variety of airlines in China and expands to include established airline brands in Africa, Europe, South America and most recently with a significant investment in Virgin Australia in Australasia. Beyond airlines, The HNA Group’s reach spreads across multiple industries many of which directly and indirectly help support its flying business. These include HNA Capital, HNA Hospitality Group, HNA Innovation, HNA Real Estate, HNA Retail, HNA Logistics and HNA Ecological Technology Group. Within aviation HNA Airport Group currently has management and cooperation projects at 13 Chinese airports which together handled 35 million passengers in 2015. These encompass Haikou Meilan International Airport, Sanya Phoenix International Airport, Qionghai Boao Airport, Yichang Sanxia Airport, Weifang Nanyuan Airport, Manzhouli Xijiao Airport, Anqing Tianzhushan Airport, Tangshan Sannvhe Airport, Songyuan Chaganhu Airport. Elsewhere, HNA Tourism owns Caissa Touristic, China’s top outbound tour operator, which runs more than 200 retail stores offering over 8,000 travel products and has a growing presence in markets such as Europe and Oceania. It also owns TransForex—China’s first non-financial institution that is qualified to provide individual domestic and foreign currency exchange service. So how many airlines does the conglomerate have an interest in? Well, at the last count it was close to 20, although for some the ownership structure is a little blurred via joint venture shareholdings, and subsidiary partnerships. "HNA Group is committed to expanding in the airline industry through strategic investments in companies with strong market positions and excellent management teams,” says Adam Tan, president of HNA Group. Hainan Airlines remains the flagship and best known operator of the group and is now firmly established among China’s top tier of airlines alongside the likes of Air China, China Eastern Airlines and China Southern Airlines. After initially launching flights transporting tourists to Haikou, often dubbed China’s Hawaii, from Beijing it now operates from bases in eight Chinese cities (Beijing, Dalian, Guangzhou, Haikou, Shenzhen, Taiyuan, Urumqi and Xi'an) to a network of around 100 destinations, including a growing international route map that spreads into Europe, North America and Oceania. The airline has doubled in size since 2008 when it first introduced flights to North America on the Beijing – Seattle city pair and it now links three Chinese cities (Beijing, Shanghai and the only direct US link from Changsha) to seven destinations in Canada and the USA, with flights on seven of its nine city pairs being introduced in the past four years. In Europe it has also grown by adding new links to Manchester, Paris, Prague and Rome in the past two years, including non-stop links from ‘regional’ cities such as Chongqing, Xi’an. The long-haul growth is also spreading among some of its lesser-known Chinese interests. Capital Airlines and Tianjin Airlines have both introduced widebody capacity in the past 12 months and launched or are planning intercontinental flights from Beijing’s Capital International Airport, Chongqing’s Jiangbei International Airport Hangzhou’s Xiaoshan International Airport and Tianjin’s Binhai International Airport into Europe, North America and Oceania. Capital Airlines has also recently received CAAC approval for a licence to serve the Beijing – Mexico City market. These two airlines also have notable domestic and regional operations within mainland China and together with a number of smaller carriers provides HNA Group with interests across the country and has even lead to the formation of a new low-cost alliance, U-FLY. On the passenger side the businesses comprise Fuzhou Air, Grand China Air, Lucky Air, Urumqi Air and West Air, with Yangtze River Express and Deer Jet expanding its reach into the freight and executive arenas. In May 2016, Air Chang’an relaunched domestic operations from Xi'an’s Xianyang International Airport hub in Shaanxi, while a newly established joint venture with the Guilin municipal government (in partnership with Guilin Tourism Development), Guilin Airlines, took to the air with its debut flight in late June 2016 linking Liangjiang International Airport in the scenic Guangxi Zhuang Autonomous Region with domestic points in mainland China. The start-up follows the formation last year of Guangxi Beibu Gulf Airlines (or GX Airlines) a joint venture between Tianjin Airlines and the Guangxi Beibu Gulf Investment Group. And there is more to come. In October this year Ningbo Airlines is set to fly from Ningbo’s Lishe International Airport, serving a major city in the Yangtze River Delta region and the second largest in Zhejiang Province. As per other start-ups HNA Group will partner with local state-owned companies to invest around $155 million in the low-cost carrier which plans to operate domestic and short-haul international flights within Asia. In the former British colony of Hong Kong off of southeastern China, an autonomous territory and Special Administrative Region of China, HNA Group also controls both Hong Kong Airlines and low-cost carrier HK Express, which provide direct competition to national entity Cathay Pacific Airways and its recently rebranded regional business Cathay Dragon (formerly Dragonair). A strong home network for sure, but it is HNA Group’s international investments that are gaining industry attention and which like its Chinese operations have grown from very modest roots. This started when a handful of excess Embraer ERJ-145s from the Tianjin Airlines fleet were transferred to West Africa to help set up Africa World Airways in partnership with the China-Africa Development Fund at the start of this decade. An investment in Turkish freight carrier ACT Airlines in 2011 and its rebrand as myCargo highlighted HNA Group’s continued intention to grow, but it was the acquisition of a significant stake in French carrier Aigle Azur that clearly showed the ambitious development strategy of the business. This has given HNA Group a presence in Europe and expanded its reach in Africa. It is thought to have been part of a plan to gain licences to serve additional markets between China and France, although external factors are thought to have stopped this being achieved. More recently HNA Group acquired a small stake in South African carrier Comair which operates scheduled flights under a British Airways franchise agreement across the country and parts of southern Africa as well as under the LCC brand Kulula.com. Last November, HNA Group acquired a 23.7% stake in Brazilian carrier Azul Linas Aereas and through the partnership the companies will cooperate in the development of code sharing, new route development to support the growing passenger demand between China and Brazil. This deal has already seen HNA Group agree to take over delivery of two of three Airbus A350-900s originally destined for Azul in 2018 as part of a five aircraft lease deal with AerCap. The Azul investment also saw HNA Group acquire a small shareholding of the economic interests of European carrier TAP Portugal, a deal that was added to in mid- July after it agreed to acquire additional convertible bonds, growing its stake to 23% through its involvement in the Atlantic Gateway private consortium that owns half of the carrier. Most recently, HNA Group agreed terms on a $115 million equity placement in Virgin Australia, boosting its shareholding in the Virgin Australia Group to approximately 13%. It has a stated commitment to increase its shareholding over time up to 19.99% as part of a strategic partnership that will likely see Virgin Australia and HNA Group airlines add new flights between Australia and China. In the latest innovative move in the continued China airline growth, HNA Group has built on the synergies within its company portfolio to launch a new low-cost carrier alliance. The U-FLY alliance brings together three of the group’s regional businesses in China to established a combined network of 85 destinations across the Asia-Pacific region with a total of 168 city pair options for travellers. Hong Kong-based HK Express is taking a leading role in the formation of the new grouping which will work to make travel more affordable and accessible than ever before. It will be joined in U-FLY by Kunming-based Lucky Air, Urumqi-based Urumqi Air and Chongqing-based West Air and others could follow in the future. “With the launch of the first LCC alliance in the world, we are entering into a new era of travel that speaks to what travellers really want: flexible and affordable routes that are also safe and secure,” says Andrew Cowen, Chief Executive Officer of HK Express and the U-FLY Alliance. “Thanks to the cooperation from the innovative low-fare airlines, we are able to connect travellers from Asia and Greater China to an ever-increasing network of cities,” he adds. There will be an obvious focus on China initially but as other LCCs join the goal of U-FLY is to develop a pan-Asian offering which provides an expanded network for low-fare travel across the region. John Strickland, director of JLS Consultancy says that although the HNA Group investments may appear a little random, there is a clear focus to its strategy as it proactively seeks growth opportunities outside of its home Chinese market. “These can strengthen its home market position as is the case with its investment in Virgin Australia where there are already significant volumes of Chinese tourists to Australia and it can gain additional domestic market access to Australia. Azul, for example, allows it to tap into the growing Latin American market which will play an increasing role in trade and tourism with China in the coming decades,” he adds. The model and investments in airlines as geographically diverse as Azul, Virgin Australia and Comair along with the acquisitions of Gategroup and Swissport are almost a throwback to the past when major carriers owned smaller carriers and GDSs as well as handling and catering companies. However, John Grant, director of JG Aviation Consultants, describes it as “a really shrewd strategic move by the Group” creating a mix of horizontal and vertical alignments within the wider aviation sector. “Spreading corporate risk, reducing reliance on the Chinese Yuan by investing overseas and effectively placing a flag on each major continent reflects both the stature of the group and its commercial nous,” he adds. What is next for HNA Group is unclear, but what is sure is it will be linked with any airline that is seeking new investment. The Group reportedly hired bankers to evaluate a possible acquisition of a large minority shareholding in UK carrier Monarch Airlines earlier this year to potentially gain a stronger European foothold, while it was also said to be interested in the sale of Virgin America. In fact in the last month senior HNA Group officials held in-depth discussions about a potential future cooperation with African low-cost carrier fastjet. HNA's chairman, Chen Feng, is among a new breed of Chinese tycoons keen to construct global business empires and analysts believe his development strategy for the business is still in its infancy despite having already spent billions of pounds as part of a global takeover spree. His involvement in the aviation sector began with his work for national regulator, the Civil Aviation Administration of China (CAAC), but his airline experience began in the early 1990s when after a spell working for the World Bank he was recruited by the island’s local government to establish Hainan Airlines in 1993 with an initial fleet of just two aircraft and spawning what many analysts now see as one of the major future players in a globalised aviation sector. 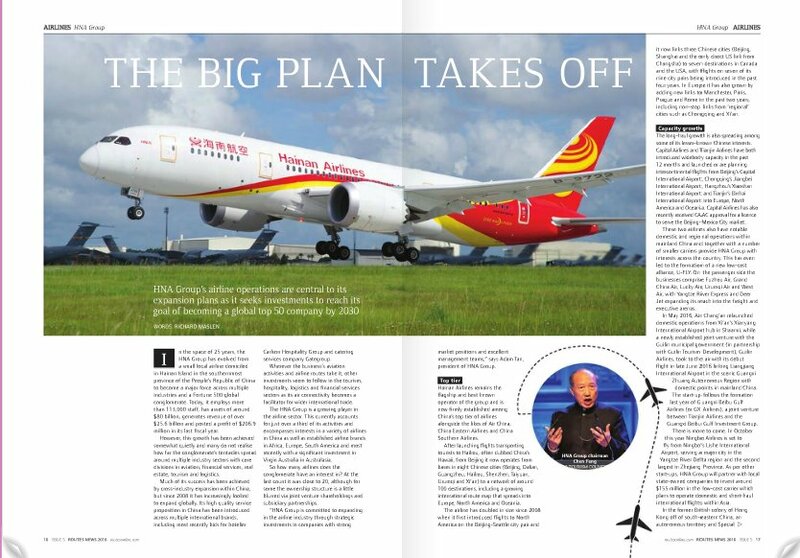 “I suspect that the HNA Group story and its acquisition trail still has a long way to go as it seeks to both expand its footprint and diversify its risk across other markets and travel related sectors,” says Grant. A recent interview with Chen Feng would suggest that this will be exactly the case with the business looking to do more deals because he is confident about the growth of tourism in spite of the country’s economic slowdown. “Of course!” said when he was asked in an interview with the Financial Times whether mergers and acquisitions will continue. “The more money Chinese have, they go all around the world. Any country that doesn’t have Chinese tourists, then that country has a problem. So the development of aviation has a big potential. There will be an impact [from China’s economic slowdown] but it won’t be that big. So we’re very confident,” he told the Financial Times. After entering the Fortune Global 500 list of the world’s largest companies by revenue at number 464 in 2014, HNA Group has continued its growth. In fact in the last 12 months its spending spree has exceeded $20 billion and a deal to buy Ingram Micro, a US information technology group, it could turn HNA group into one of the world’s top 100 companies, with revenue exceeding $100 billion. With the rapid expansion of the intercontinental route networks of its airline subsidiaries and an emerging alliance strategy across its Chinese interests, the HNA Group will certainly no longer be able to continue to grow under the radar, and it is sure to become one of the most recognised global business brands, and not just a miscellany of airlines. 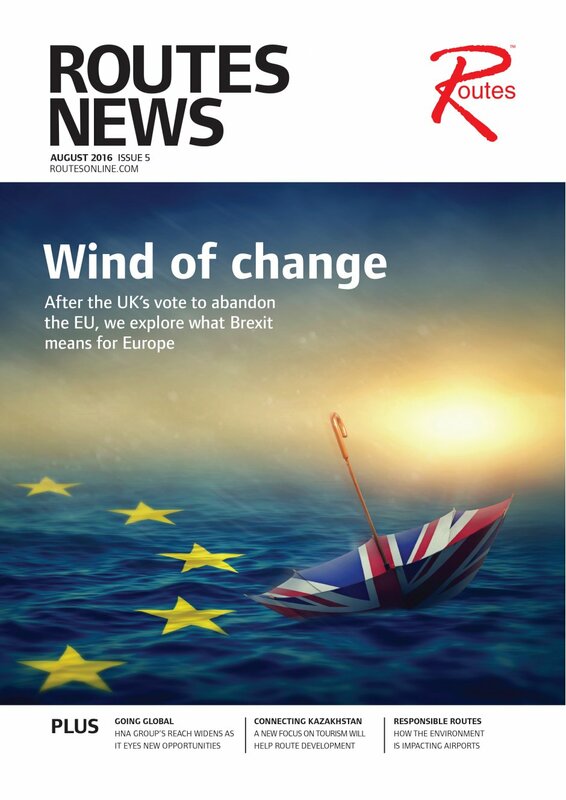 PLEASE CLICK HERE to view the magazine.